As part of the city-wide effort to celebrate World Heritage Day, we organised a repeat of the Malleswaram Hunt from 3 to 5 pm. This time we included 1st and 2nd prizes. These were traditional games from the Crafts Council of Karnataka Kamalini shop in Malleswaram. We had about 20 people in 9 teams who participated. "We had a great time, discovered Malleswaram, some very quaint places and found interesting things to talk about. It was a brilliant idea! Please keep more and inform us! Thanks you all!!" "One of the most educative expeeriences for me. 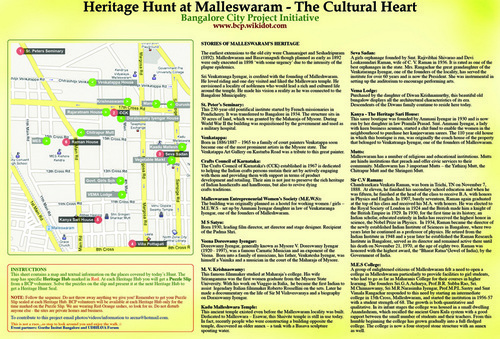 Even though I stayed in Malleswaram since 1972, I couldn't see these heritage places. You have given me this golden oppurtunity. Thank you and do something like this very often." One of the moments where we could also learn from a survey. This is a good initiative. This was a great experience. Though we stay in Malleswaram we learnt a lot and the kids had a great time! Thanks very much!! Enjoyed very much - thank you!! I just enjoyed. A lot of fun! Fun! Let me know of the next hunt. While the participants really enjoyed the hunt, I did feel that it was under attended. Perhaps these events should be advertised in architecture and art colleges extensively. We could do one such hunt in collaboration with local schools. Teams of students under the supervision of teachers could participate. Additionally, apart from the press publicity we need to advertise such events in the local communities itself. My guess is that Malleswaram residents would be motivated to learn more about the history and significances of their locality. ON a different track - we need to make information gathering a more local and community-driven process. There must be multiple histories to a locality - and it would be great to try and tap these. The Heritage Hunt at Malleswaram is a BCP experiment designed to engage in a more self-sufficient model that ideally over time would be sustainable by the communities themselves. With this event we decided to set it up so that volunteers would be standing at each Heritage Hub. Participants would collect Heritage Hunt Seals on a Puzzle Slip that they would have to solve along the way. They were given a new Puzzle Slip at each Heritage Hub. Eventually the hope is that people would either download maps and questions, that are posted online here, of the localities that they are interested in and go off and look for the clues in the buildings and sites that they would see. Or conversely, we set up the communities themselves to have these maps and see if they would push it out to their customers. 1. We had about 15 participants in 7 groups. Possibly the reduced publicity combined with the fact that there was a Heritage Walk so recently conducted in the same locality was a deterrent. 2. The younger participants expected more interaction and challenging activities. They suggested that some of the questions should be framed such that they force the participant to actually interact with the community - something that we worked hard to avoid. Perhaps we could set it up such that some parts of the hunt would have the participants buy something from the local sellers. 3. A lot of them found it too long a walk - 3 hours including all the stops. 4. Some of them complained that the questions to easily be answered by just reading the blurbs. They suggested that more site-specific questions be included. 5. It seemed that people would prefer to 'hunt' in groups of 5-8. We thought that they would do so in pairs. 6. The 'hunters' were really sharing information with each other. Perhaps this tendency, if observed in following hunts, could be used as part of the game. 7. Some people were looking more for a challenge in terms of a Prize at the end for someone who came in first. 8. Quite a few folks stopped along the way to snack and shop. This is perhaps to be encouraged and can be built into the game. 9. The time cushion at each Hub seems a bit short. We might have to re-design this part. 10. We could perhaps invite participants to arrive at a specific time (rather than the 1 hour time-slot option) and then send them off in batches of 5-10 with a gap of 10 minutes between each. Rediscover Malleswaram, identify the landmarks, get the obligatory rubber stamps, solve a few intriguing clues and claim the treasure at the end of the exciting exercise. Just come to St. Peter's Seminary, collect your map/task sheet (against a registration fee of Rs. 50) and start walking! Oh, and NO early bird prizes, so don't hurry past any of the sights and there's more than enough treasure for all participants! And did we mention that there is a special theater performance for those of you who do the entire walk! The event is open to all. Registration open from 2.30 to 3.30 p.m. only Read on below for more information about this quaint locality and see the places you will visit along this hunt.